Clearaudio Performance SE review | What Hi-Fi? Clearaudio’s formula for success is simple to describe but hard to accomplish. It’s what’s proved to be an irresistible mix of high-quality engineering, intelligent use of materials and a more than passing nod to finish. The final piece of the puzzle is, of course, sound quality. and the original has to do with the plinth construction. While the first version used Starion (an artificial stone), the SE moves to an aluminium/high-density fibreboard sandwich, which the company says produces a better-behaved, more stable platform. The rest of the package remains unchanged, and we don’t think it’s any the worse for that. The turntable’s floating magnetic main bearing is what catches our attention first: it’s a clever design that reduces bearing noise and friction to very low level – always a plus in mechanical systems such as this. The ceramic magnetic main bearing (below) is the Performance SE’s star turn. 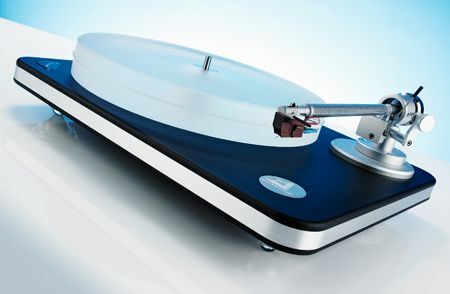 Almost all turntable bearings use a metal spindle spinning in a housing, with a small ball-bearing separating the two. Done well, it’s a fine arrangement, but friction still generates mechanical noise. Clearaudio uses magnetism and a ceramic spindle in its bearing design. The housing spins around the ceramic spindle but floats slightly above the end of it. It is, in effect, floating on air rather than sitting on a bearing. This reduces friction – and so noise – as a result. A 40mm thick acrylic platter rests on this bearing; it doesn’t need a mat. Why? Because the physical characteristics of acrylic are close to vinyl – so resonances bouncing around inside the record find an easy path into the platter, where they are damped away. Getting rid of this unwanted energy is a good thing, as then the cartridge is left to deal with the information in the record groove only. An outboard motor drives the platter through a stepped pulley and circular cross-sectioned belt. Speed change is manual, requiring a shift of the belt between pulley steps. It’s easy to do, though many rivals at this price level manage it electrically. The motor housing also carries the On/Off switch (above). In engineering terms it makes sense to remove the motor from the main turntable. Doing this reduces vibrational energy fed into the main structure, and that makes the cartridge’s life easier as it tracks the record. The Performance SE comes supplied with the well-regarded Satisfy Carbon Directwire tone-arm (£1430, if bought separately). The name says everything: this slick tone arm uses a carbon-fibre tube and continuous wiring from the cartridge tags to the phono plugs. Most rival designs have at least one extra join. The Maestro, a wooden-bodied moving-magnet cartridge, completes the package. At £750 it’s pretty pricey by MM standards, but is easy to fit thanks to a straight front edge, and clearly capable when it comes to sound. Clearaudio gives the user the option to use metal mounting screws or plastic alternatives; in our experience, plastic gives a (marginally) better sound. The plinth’s three feet are easy to adjust, making levelling a breeze. If you have a little experience it should all be up and running in around 30mins, but don’t worry if you don’t – at this price the dealer should be happy to set it up for you. If not, take your cash elsewhere. The package as a whole delivers an impressively resolved sound. It picks up subtle details very well, helped by low levels of mechanical background noise – we suspect the ceramic magnetic bearing and well-damped chassis contribute to this enormously. At first we weren’t sure of the Clearaudio’s ability to convey rhythms: dance-inspired albums such as Four Tet’s There is Love in You just didn’t charge along with the enthusiasm we expected. Longer listening showed the Performance SE has an understated way with timing, but still manages to convey the pace and momentum of music properly. However, it doesn’t thrust the rhythmic aspects of music at the listener as some rivals (rather enjoyably) do. the large-scale classical of Beethoven’s dramatic Fifth Symphony. You can add a stable, well-defined soundstage and tuneful bass to the list of plus-points too. Some rivals – Linn’s LP12 Majik, for example – sound fuller and warmer, particularly in the bass, but they aren’t quite as sonically transparent as this Clearaudio deck is. This package competes head-on with the best mix-and-match rivals when it comes to sound, yet is also cosmetically cohesive and easy to use. It’s a fine buy.